Last weekend, my husband and I found ourselves with nothing to do (shocker, yes I know!) and were brainstorming. What did we like to do when we were kids that we hadn't yet exposed our kids to...? 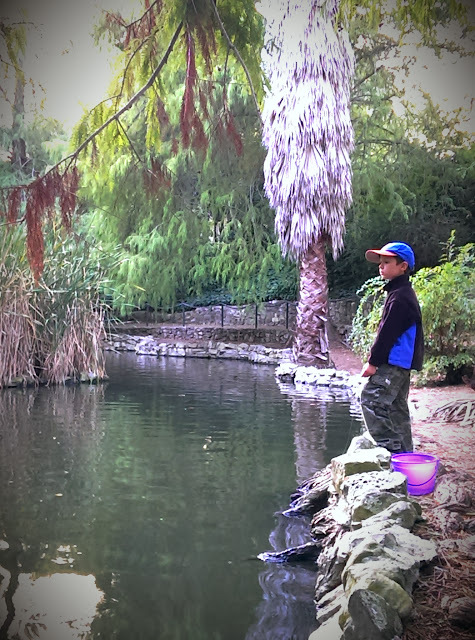 Both of us grew up on the Palos Verdes Peninsula where we still have small streams and a bit of outdoors for kids to roam. We had grown up playing with frogs, fishing off the beach, hiking through the many horse trails and even crawdad fishing. What is a crawdad? It looks like a miniature lobster that lives in slow moving streams and lakes and rivers. There are more than 500 species of them through out the world. You might have heard it called a crayfish which is the scientific communities name for it. They are also known as a crawfish, yuppy and mudbugs. Known as shellfish, they don't always live near a large body of water. Many people choose to hunt them for their sweet taste and soft texture. While I never ate ate any of our locally caught crawdads, it was a fun and sometimes dirty past-time that we enjoyed as kids. 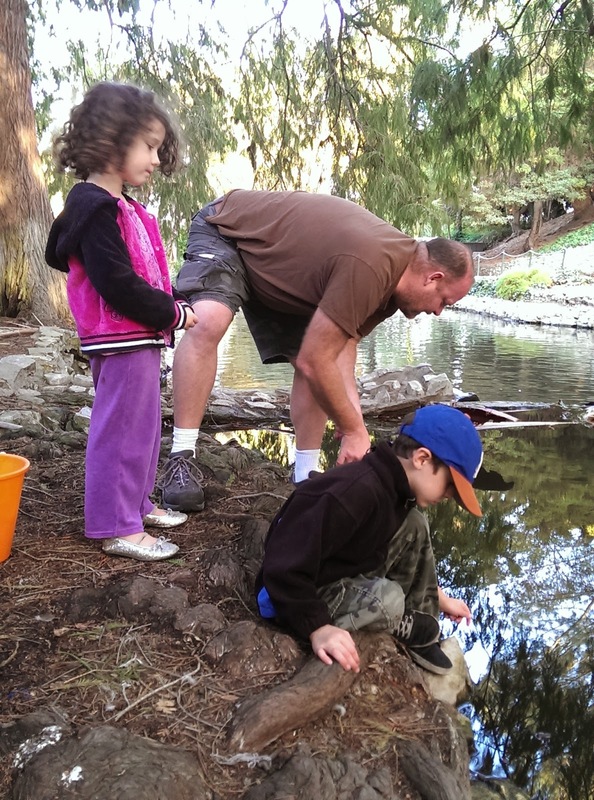 What do you need to hunt crawdads? Not much. We used about 4 feet of fishing line(light test works great) hot dogs, a small weight, a bucket, and if you want a sure fire bait, bacon. Tie your chosen bait on your fishing line with a small weight to get it to sink to your chosen spot. I recommend finding a shallow area where you can still see the bait. Drop in your line and watch and wait. Soon if your stream has crawdads, you will see your bait moving around even though you might not see the crawdad. Slowly put tension on the line, wait until you can see or feel that it has a good hold of the bait and bring a bucket close to the water as you wind your line in. If you can get the crawdad to the surface, scoop it into the bucket without leaving the water. Sounds easy, right? It is a challenge to get them to release the rocks with its legs while still holding onto the bait. Also, if you happen to lift it out of the water, it will let the bait go. There are no hooks involved so it is a matter of patience, skill and luck to get them into your bucket. 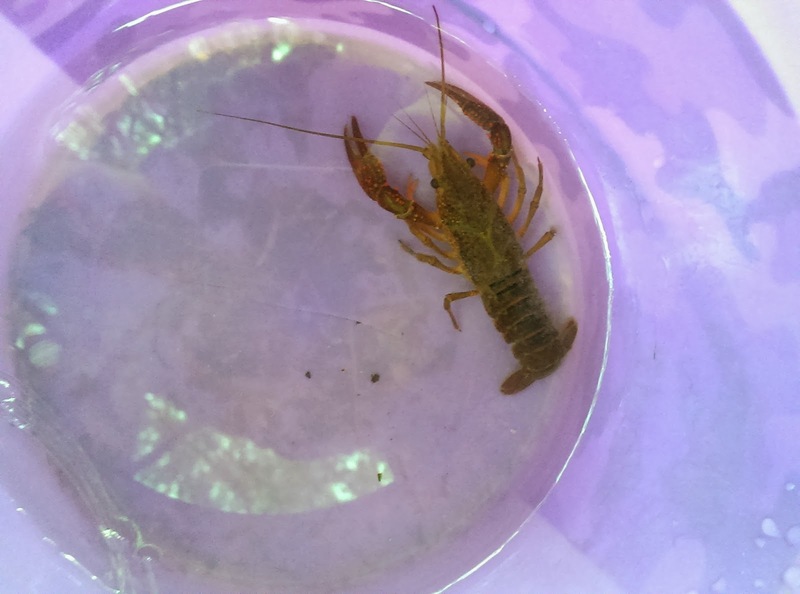 We caught two crawdads last weekend but one that we called "Houdini" got away as my son accidentally knocked the bucket into the water. The other one is now a cherished pet in our household that is in itself a menagerie. Where locally can you find crawdads? Our favorite spot is at Averill Park in San Pedro. It is a popular spot for weddings, photography, picnics and general horseplay. It is also home to a wide abundance of waterfowl in the little streams that run through the park. What time is best to catch them? We went at sunset. They are most active in the night time so early morning or late afternoon is best. I don't recommend going to parks at night. I hope you enjoyed a new activity to share with your children. Please get them outdoors as often as you can and let them get muddy and be kids.